The Forbes’ richest Malaysian list is dominated by men. The only woman in the list is Puan Sri Datin Chong Chook Yew. At the 33rd spot of the list, Puan Sri Chong is the co-founder of Selangor Properties Berhad, one of the leading real estate companies in Malaysia. With a net wealth of close to half a billion, the 93 year old tycoon was the first director of the company back in 1963 when it was newly formed. She would then become the Managing Director of the company which she handled for about 40 years. This makes her one of the prominent female corporate leaders in Malaysia. In 2000, she retired and took over the chair of the company which has since been growing by leaps and bounds. She founded the company with her late husband and currently holds a controlling stake in Selangor Properties. With projects like Bukit Tunku and UK Heights in the Klang Valley, her portfolio is seen to be among the most significant. After all, the addresses are known to be upscale, luxurious areas in the country. 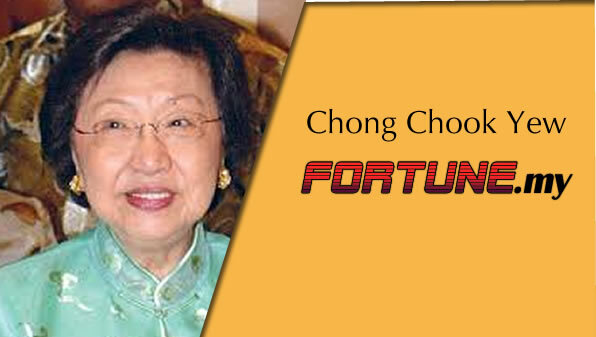 Puan Sri Chong has enjoyed her source of wealth from the property development sector and continues to do so ever since. Puan Sri Chong has 4 children. Puan Sri Chong graduate with a Teacher College Professional Diploma and a Master of Arts from Columbia University, USA.